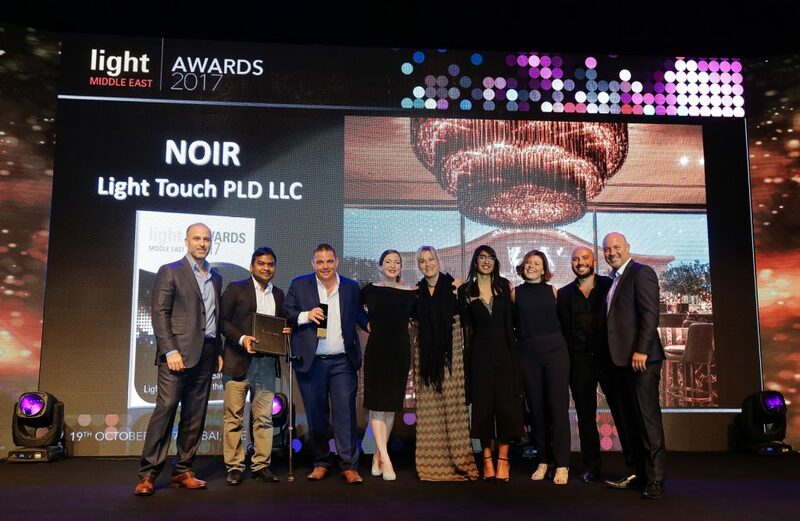 Light Touch PLD celebrated Noir winning the prestigious Restaurant & Bars Lighting Project of the Year at the Light Middle East Awards on the 19th October 2017. Paul Miles invited the team onto the stage and expressed how proud he is of the Light Touch Team and what we have achieved together. Paul said Noir was a fantastic but challenging project to work on, the lavish finishes and the exuberant nature of the project allowed us to express our creativity. The lighting design embraced the provocative nature of the of the bar, the dark finishes throughout, colourful artworks and featured the unique projection wall on the terrace. The win was celebrated in style and an enjoyable evening was had by the LT team.